This is the second post in a series of posts from a sermon preached on December 14th, 2014 entitled The Wise Men and the Christ Child. Be sure to also read part 1 and part 2. First, come and see just as the Wise Men did. Come and see the one born King. Come and see the one who was cut off for your sakes. Come and look long at the one who lost his life so that you could have life. To trust in Christ simply means to claim credit for what he has done. You have been working to earn credit with God, with your spouse, with your boss, with yourself. The problem is you have no credit. You never feel as if you have done enough to prove yourself; to justify yourself. Guess what– you haven’t and you can’t. That’s why Christ was born and lived before God as you should have—he never shut God out. He always honored God. At every point he obeyed God and gave him priority. And he is asking you to look at him and take credit for what he has done. You’ll have that opportunity in just a moment. Secondly, our church has to work towards the same kind of diversity we see in Matthew’s gospel. There is no segregation in the kingdom of Jesus, therefore there can be no segregation in his church. There can be no segregation in our small groups. There can be no person who can’t enter our services and hear the good saving news of Jesus. One of the key signs that a church isn’t diverse enough is that everyone is comfortable. You are comfortable with the, with the energy level, with the people on stage, with the social strata. A sign that your small group isn’t diverse enough is that you’re comfortable. You are comfortable with the makeup of the group, the people leading, the way everyone prays, the outreaches you are involved with. A church, or small group, that’s working towards gospel honoring diversity is one in which you aren’t always comfortable. In other words, there can’t be any one reigning culture that excludes all other cultures. The gospel of a Christ who came to redeem every nation tribe and tongue has to challenge the way our church looks and acts. It has to challenge the way your small group meets and who it invites. We always have to strive to reflect the diversity of the nativity- shepherds and wise men. Finally, we have to go and die just as Jesus did. It’s natural for us to love those who love us and hate those who hate us. But, Jesus rejected that ethic even in his birth. He left the most exclusive gated community to move into the neighborhood of those who hated him. Jesus rejected that ethic for his disciples in his first sermon. Matthew 5 when he said “You have heard that it was said, ‘You shall love your neighbor and hate your enemy.’ But I say to you, Love your enemies and pray for those who persecute you”. Finally, Jesus categorically rejected that ethic on the cross. So what we see in the nativity, and the teachings of Jesus and the death of Jesus is a new kind of ethic. It’s an ethic of sacrifice. Nothing demonstrates the effect the gospel has in our lives than when we sacrifice for those we disagree with, those who cannot pay us back, and those who attacks us. Many of you have been apart of that this Christmas season. Celebrate. Church–when you really see the eternal God coming to live and die in human flesh it changes everything about you. It calls us to be a diverse church looking more and more like the diversity of God’s kingdom. It causes us to love our enemies, just as God for Christ’s sake loved us. This is the second post in a series of posts from a sermon preached on December 14th, 2014 entitled The Wise Men and the Christ Child. Be sure to also read part 1 and part 3. If you want to understand the Bible you can’t treat it as a dogmatic handbook. It isn’t a bullet point list of “do’s” and “don’ts”. There are certainly times when the Bible is explicit about what you should believe about God, and life, and justice and so on and so forth. But the Bible isn’t a cold unfeeling list. Rather, the Bible, as Gerhard Vos said, is a historical book full of dramatic interest, and you have to read the scriptures with an eye towards that dramatic interest. Look for new stars in the sky. Search for God like the Wise Men. Worship God like the Wise Men. Give to God like the Wise Men. Don’t kill babies like Herod did. All of those points could be argued from the text, but none of those capture the essence of Matthew’s message. None of that list conveys the mystery and wonder that Matthew wants you to see. You have to read the scriptures as a drama unfolding with plot, and turn, and foils and resolution. That’s the only way you will appreciate its significance. And you find that significance in two words: irony and joy. To understand this story you have to see the irony in it, and you have to see the joy in it. Irony- Think back to the story– A caravan of Magi, having read the scriptures of Israel and expecting a King, along with their families and a small army, are traveling over 1,000 miles across the Arabian peninsula to find the one born king of the Jews. Meanwhile the Jewish king and all his chief priests and scribes are oblivious. Isn’t that ironic. Herod is five miles down the road from the greatest gift in human history. The chief priests, men who should have known the prophecies and known the stars, have no clue. What is Matthew showing us? Matthew is showing us that the good news of the Christ child isn’t just good news for one privileged nation, or ethnic group, or social class. The gospel isn’t just for those who are on the in; those who have a Bible on the shelf, those who come to church. Remember who visited Jesus- shepherds and Magi. Matthew tells us that the gospel destroys every conceivable barrier you and I throw up against it. It always challenges the social circles we are comfortable with. God invites people we would never imagine. Salvation is found in Christ alone– but all people are welcome to come to him. He came to rescue shepherds and philosophers, and school teachers, and small business owners, and those on welfare, and white collar alcoholics, and divorcées and pornographers and democrats and republicans and terrorists. Don’t you see the irony of our situation? We spend so much time posturing to be in the right crowd and associated with the right groups while Jesus lived and died for all of them. The inclusion of the Magi—Pagan astrologers—is God’s way of saying don’t assume you know who I love and who I don’t love. And don’t you dare exclude those I am calling into my family. It’s also ironic that these court officials in Persia traveled thousands of miles in order to pay homage to a toddler. That isn’t lost on Matthew. You have to create a mental picture of this. Imagine– a caravan of a few hundred people stop outside the small house of Joseph and Mary in Bethlehem. As many as possible crowed in and start unloading boxes of gold, spices and oils. Then they worship a 12 month old. Why? I have an 18 month old who I love, but I promise you I don’t bow down to her. What would cause the most dignified men in Persia to bow down to a toddler? Well they understood exactly who this toddler was. And if you read the rest of Matthew you find out that this toddler grows into a man who has control over disease, demons, and even life and death. If you read the rest of the New Testament you see that the baby, lowly meek and mild, will one day return to this earth with sword in hand and a robe dipped in blood in order to judge the nations. While that may cause fear, Matthew also shows us joy. Though the Magi understood that this child would one day judge the nations they don’t respond with fear. Matthew tells us they rejoiced with exceedingly great joy. Why? Unlike earthly kings who oppress the poor, Jesus was born into a stable and called broken people into his Father’s family. You see, all of the kings in history were born into royalty, or they took it by bloodshed. In other words, if you were a ruler in the ancient world you were either detached from the common people due to your birth, or you ruled them with terror and fear. Jesus is a completely different kind of king. The Son of God chose to give up his position of royalty, which belonged to him for eternity and was born into a poor family from Galilee. In doing this he was showing us what kind of people he would call to himself. Even the poorest of the poor is welcome. In fact, an ancient prophecy of the Messiah is found in Isaiah 43 and says, “a bruised reed he will not break, and a faintly burning wick he will not quench; he will faithfully bring forth justice.” That prophecy tells us what we can expect from the savior king who God sent into the world. When bruised people approach this king he will not break their spirits. When those whose light is dwindling come to him he will not put them out. Unlike earthly kings who kill their own family members, Jesus would die for his enemies. In this story Matthew contrasts the treachery of Herod against the compassion of Jesus. Herod executed members of his own family– Jesus forgave the very people who executed him. And I don’t mean Roman centurions or the ruling Jewish rulers. I mean us. The Bible plainly teaches that before Christ found us, we were his enemies. God created us and made us for his glory, and we denied him access to our life. We shut ourselves off from him and we broke his laws. Because we severed our relationship with him we deserved to be cut off. The wise men found supreme joy that there in a clay house in Bethlehem stood the one who would be cut off so that they could be brought in. My friends, until you realize that you are cut off from God, and Christ in love, chose to take your place you can’t understand joy. How should we respond to such a king? Read part 3 of this series to find out. This is the first in a series of posts adapted from a sermon preached on December 14th, 2014 entitled The Wise Men and the Christ Child. Be sure to also read part 2 and part 3. The story begins in the little town of Bethlehem. That’s where Jesus, the one born King of the Jews, launched his campaign. Bethlehem really was a little town. It’s located 5 miles Southwest of Jerusalem. If you read through the Old Testament the city of Bethlehem doesn’t show up much. It isn’t the seat of government. That was Jerusalem. It wasn’t like Carmel where Elijah called down fire out of heaven. It had little historical significance unlike Bethel. That’s where Abraham first built an altar to God in the Promised Land and where Jacob wrestled with God and was given a new name, Israel. Bethel means “The House of God.” Bethlehem means “The House of Bread.” Nothing of importance ever really happened in Bethlehem. In fact, there are only 2 significant things that happened there. Jacob, one of Israel’s patriarchs buried his wife Rachel there, and David, Israel’s most famous king was born there. Aside from these two events Bethlehem almost goes unmentioned in the histories of Israel. And yet, 700 years before the birth of Christ the prophet Micah foretold of his coming when he wrote, “And you, O Bethlehem, in the land of Judah, are by no means least among the rulers of Judah; for from you shall come a ruler who will shepherd my people Israel.” It was only fitting that the heir to David’s throne would be born in the city of his ancestor. David was a shepherd who went out on behalf of the nation to fight against Goliath, and so David’s greater son Jesus would go out on behalf of all humanity to fight against our sin. But unlike David, who only risked his life for the nation of Israel, Christ would give his up completely for us. But more on that in a little bit. In Bethlehem, 2000 years ago, the hopes and fears of every age were met by God in human skin crying for his milk. Secondly, Matthew tells us that Christ was born in the days of Herod the king. Matthew makes sure to root his narrative of Jesus in history so that we can go back and be assured of the truthfulness of his message. Herod was a family name, and there are a handful of Herods mentioned in the New Testament. This Herod was known simply as Herod the Great. He was a half-Jewish half-Idumean man, which to any 1st century Jew- half-Jew was the same as not a Jew. Herod was elected to rule in Israel by the Roman Senate in 37 BC, and ruled until 4 BC. Now some of you are wondering how it is that Herod ruled when Christ was born if his rule ended at 4 “Before Christ.” The short answer is that a man named Dionysius Exiguus screwed up our calendar in AD 525. So Jesus was actually born around 5 BC. His rule in Israel was responsible for one of the greatest public works campaigns in history. He rebuilt the temple in Jerusalem and you can still see a remnant of Herod’s temple today. It’s called the Western Wall, or the Wailing Wall, and Hebrews still go there to pray. Herod rebuilt cities, and he stabilized the region. Herod, however, had a lethal flaw. His hunger for power and authority was overwhelming, and he would kill anyone he deemed a threat. In fact, the saying went that it was safer to be Herod’s sow than Herod’s son. Late in life Herod had one of his wives and two of his sons executed for fear that they were plotting against him. If you pick up reading Matthew 2 where our passage ends you see that Herod, for fear of the Christ child usurping his throne ordered the extermination of all male children under the age of two in Bethlehem. Herod, like every other earthly king was corrupted by power, and now the wise men have traveled to tell him of a new King who will establish his throne. 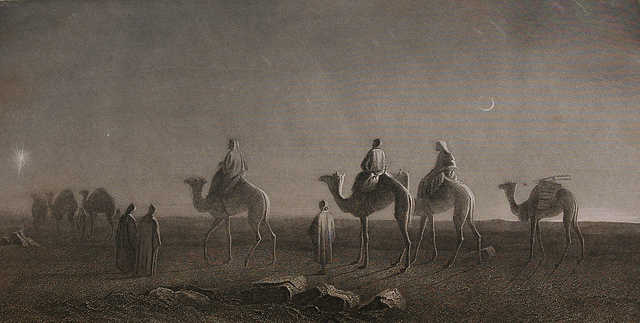 What we now refer to as the wise men were actually called Magi. The Magi were a group of priests and court officials in Persia who studied the stars and practiced astrology. Now I realize that when you hear astrology you instantly think of Madam Zostra who reads palms and lives in a van down by the river. But that’s not who these guys were. These were the cultural elites of their time; the culturati if you will. They were the most educated mathematicians and astronomers of their day. And we traditionally refer to how many wise men? That’s right, three. But as you can see from reading our text Matthew doesn’t indicate how many there were. Christians in the 7th century began to assume there were 3 Magi because there were three gifts- gold, frankincense, and myrrh. They even gave them names, Balthazar, Gaspar and Melcor. There is no Biblical evidence supporting any of that. From a historical standpoint, it’s highly unlikely that 3 men would travel over 1,000 miles, alone, across the Northern Arabian Peninsula with bags full of gold, expensive spices, and oils. Matthew doesn’t tell us how many people were with the Magi, but he does say that Herod was troubled, and that all of Jerusalem was troubled with him. I doubt that three men on camels caused widespread worry and panic in the city. It’s far more likely that these Magi, however many there were traveled with their entire houses, their families as well as a small army to guard them and their treasure. And when a caravan including a few hundred soldiers ride into town to asking all the town’s people where the new king who was just born is— then you start a panic. But how did they know to come to Jerusalem? Let’s take a look at the star they followed. Star– The big question that most people have here is, “What did they actually see?” Was it really a new star that appeared? And to be honest, there are a lot of theories. I’m sure that at least one of you is an astronomy nerd and you want to know if the star they saw was the conjunction of the planets Jupiter and Saturn in the constellation Pisces that occurred in 7 BC. The truth is I don’t know, and Matthew doesn’t seem to care. Matthew takes zero effort to explaining the celestial phenomenon. Instead, Matthew is interested in another question, and one that is far more important. Along with that prophecy, as the Old Testament was written there are many other prophecies about this same ruler. And Israel, generation after generation waited for that ruler. Even when they were carried off into exile in Babylon they took their scriptures with them. If you read the Old Testament you know of Hebrew men like Daniel, and Sadrach and Abednego who all worshiped God and waited for the Messiah—who also served as leaders for the good of Babylon. And so, centuries later the Magi in what was then Persia were still reading the scriptures of Israel and waiting for the star to come out of Jacob. Now it has appeared, and they have journeyed for many months to present their gifts and pay honor to the king who is now close to being a toddler. O, you thought the wise men were there with the shepherds. Sorry— your nativity scene is incorrect. If you want to, I guess you could put the wise men on their camels on the other side of the house signifying that they are somewhere in the middle of the Arabian Desert. So that is the History of the Story. I’m sure it’s more than you bargained for, and I apologize for ruining a few Christmas carols and your manger scene. But what does the story mean? Read about the significance of the story in part 2 of this series.